The second heartfelt story of friendship and sisterhood in this charming new chapter book series, starring a Japanese-American girl! It's a big weekend for Jasmine Toguchi! She's excited to celebrate Girl's Day--a Japanese holiday honoring women and girls--with her sister, mother, and best friend, Linnie. On Friday after school, Linnie comes over to plan their outfits for the Girl's Day celebrations. And Jasmine's neighbor, Mrs. Reese, lets them search through her old clothes for the perfect accessories. But the clothes are in her dark garage, which is kind of scary. And Linnie decides to go home early, which is kind of weird. And Jasmine's big sister, Sophie, doesn't seem to want to join in the Girl's Day fun this year, which is kind of confusing. WHAT is going on? As her big weekend plans start to unravel, Jasmine must use her sleuthing skills to spot the clues around her--and within herself. Then maybe, just maybe, she can put everything back in order before Girl's Day is over! Debbi Michiko Florence is the author of nonfiction books for children in the Kaleidoscope Kids Series, China and Japan. She is a third generation Japanese American, and many of her ideas for the Jasmine Toguchi series come from family experiences. Debbi lives in Connecticut with her husband and their two ducks, Darcy and Lizzie. 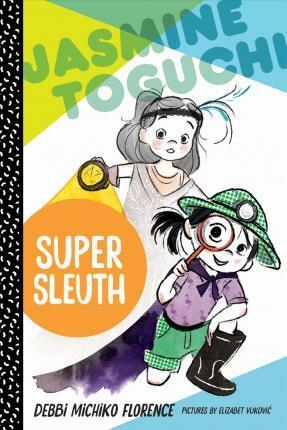 Jasmine Toguchi, Mochi Queen and Jasmine Toguchi, Super Sleuth is her fiction debut. Elizabet Vukovic received her MFA from the Academy of Art University in San Francisco, California. She specializes in children's book illustration, but enjoys experimenting with character design, concept art, fashion illustration, and decorative art. She currently resides in Rotterdam, the Netherlands.